Sunday 23rd. of April 2006. Chelsea Town Hall. Ladies and Gentlemen, I am pleased to be here today to acknowledge the dedication of Darryl Nation in taking his Father's WW2 diaries, transcribing them, and following through to the trauma of getting this work published as A Stoker's Journey. Let me declare my bias, I am passionate about documenting and preserving our Naval Heritage. My AHOY. Mac's Web Log internet site, carries over a million words, essentially about our Naval History. At the time of Federation in 1901, the new Commonwealth of Australia, took control over the Colonial Navies to form the Australian Navy. Our state of Victoria handed over the strongest Navy of all the States, including the Monitor HMVS Cerberus. When it was the only one of its class world wide, what did we do about preserving this treasure? It was towed and sunk to form a breakwater off Blackrock, and only now when all is almost lost, its guns have been removed, and work is trying to stabilise the deck to prevent it from collapsing. In 1911, in Bay Street Port Melbourne, the Drill Hall was the first building to be constructed for our young Navy, which then had it head quarters here in Melbourne over the next 75 years. But you would never ever know it, we have no public record of the RAN ever being located here in our city. HMAS Lonsdale was shut down, the site sold to become a housing estate, at least it has the title of HMAS. The Commonwealth handed over the old Drill Hall to the Victorian Government, what is the last relic of our Navy in Port Melbourne today? What did our State Government do with it? I am sad to say, they gave it to become the home of a circus, yes! Circus OZ uses it, to train its performers. In 1935, I had my medical examination there, as a 13 year old boy, selected for entry into the Royal Australian Naval College. What should we do to record the history of our Sailors? Over WW2, 30,000 men and women served our country in the RAN. I went to war as a 17 year old Cadet Midshipman in August 1939, today I am 84, among the youngest who went to sea in 1939, thus many who served in WW2 have died, it is already too late to record their wartime experiences, their stories died with them. 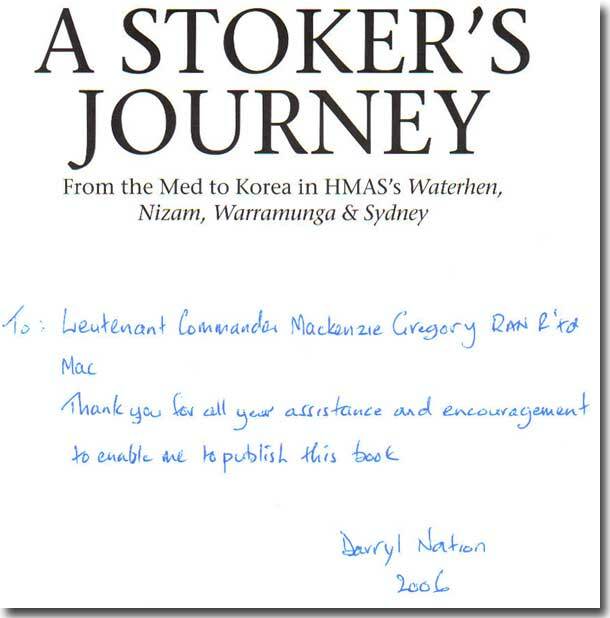 The Victorian Chapter of the Naval Historical Society of Australia is trying to put in place an Oral History Programme, whereby a web site would record the location of individual stories of our Naval veterans before they are lost for all time, that site might also include the Royal Australian Navy Memorial Log, where any one who served in the RAN would have their Name, Place and Date of Birth, Rank or Rate. It would be the only location where such information could be found, the WW2 roll initiative of the Commonwealth, records all who served in the three Services over WW2, but does not cater for the thousands who served in our Navy since its inception. A second project of the NHS is to build Navy Square, a Memorial to th RAN at the seaward end of Bay Street Port Melbourne, the likely cost about $500,000, funding this dream is the problem. I would urge the relatives of our old salts here today, to have them record their memories of their Naval service, before it is too late. 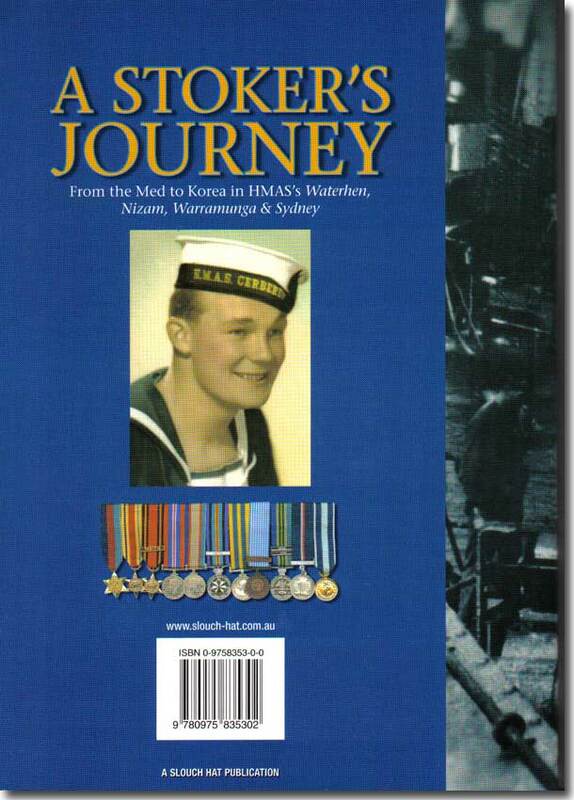 This book, A Stoker's Journey deliniates the life of Darryl's Dad, Andy Nation, in the Royal Australian Navy. Without his kind of dedicated service, our Navy could not have expanded and operated in all the oceans of the world over the war years of 1939-1945. This then is the story of Andy Nation, a Stoker, a Leading Stoker and finally a Stoker Petty Officer. 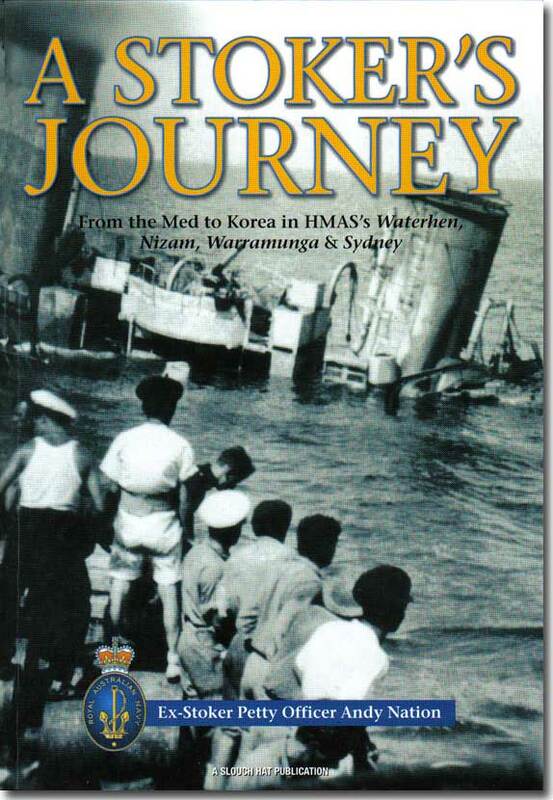 In the tough early days in HMAS Waterhen in the Mediterranean, then in Nizam, back home to join the new Australian Tribal Class Destroyer Warramunga, and what a wonderful class of ship the Tribals were, and finally Andy served in the carrier Sydney in Korea. This is about a man who was involved in plenty of action, plus the boredom of war time service that all who served at sea in WW2 knew so well and also endured. In many ways Andy's service mirrored my own, he went to sea as a young man, I was but 17 in August of 1939 when I joined the Fleet, Andy was sunk in Waterhen, I was sunk in Canberra, we both served in Warramunga, my time in her was post war. Our last ships were aircraft carriers, Andy in Sydney, me in Vengeance. During the war Andy kept his personal diary, and although this would really have been against Naval Regulations, how pleased we all are that he did so, otherwise we would have been deprived of this wonderful record, and would be the poorer for it. I too kept a Journal as a Midshipman over 1939/1941, mine was compulsory, and was viewed by my Captain regularly. It has survived to be visited often when seeking to clarify a date or action. I say again, this book is a great read and I commend it to you, do yourselves a favour and grab a copy. Darryl, you are to be congratulated for your labour of love, and on your drive in seeing your Dad's work through to its printing. I trust your work finds a growing readership. Unfortunately, Andy Nation died at Belmont, Geelong in 1999, he would have been very proud of his son Darryl today. I have great pleasure to metaphorically break a traditional bottle of champagne and officially launch: A Stoker's Journey. Thank you all, for both your attention and attendance here today. Darryl Nation. 26 Aquarius Drive, Frankston. Victoria. 3199. Australia. The Publishers: SLOUCH HAT PUBLICATIONS. PO BOX 174 Rosebud. Victoria. 3939. Australia.